On this date in 1918, Emperor Nicholas II of Russia, Empress Alexandra Feodorovna, Grand Duchess Olga Nikolaevna, Grand Duchess Tatiana Nikolaevna, Grand Duchess Maria Nikolaevna, Grand Duchess Anastasia Nikolaevna, and Tsarevich Alexei Nikolaevich were murdered in Ekaterinburg by members of the Bolshevik secret police. In the century that has elapsed since their deaths, the Romanovs have become figures of myth and legend, spectral representations of a glamorous, glittering imperial past. The reality of their lives is much, much more complicated -- as is true of the story of any family that exists in the center of power. 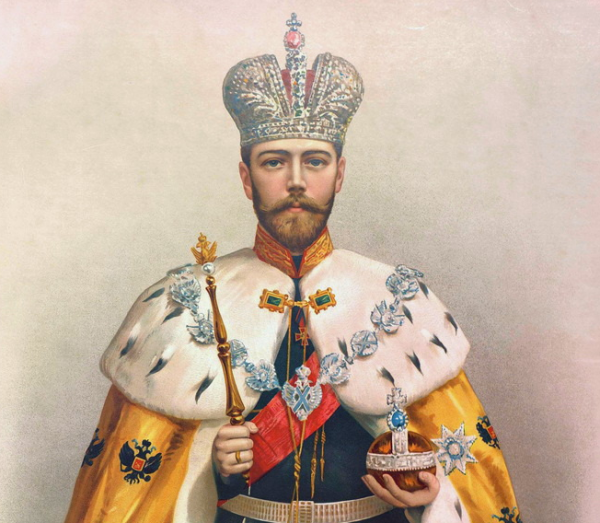 Today, we're looking at one of the most important symbols of that power: the Grand Imperial Crown of Russia. The imposing crown is studded with an incredible 4,936 diamonds. The entire piece is made to resemble a mitre, the traditional headwear of leaders in some religious traditions. The crown consists of two hemispheres (apparently representing the two halves of the Roman empire), which are edged with 75 white pearls and divided by an elaborate central arch. You'll note oak leaves and acorns in the garland design of the arch, motifs that represent strength and resilience. Atop the arch sits an enormous spinel, which weighs nearly 400 carats and has been part of the imperial collection since the seventeenth century. The diamond cross situated atop the spinel emphasizes the religious role of the monarch. 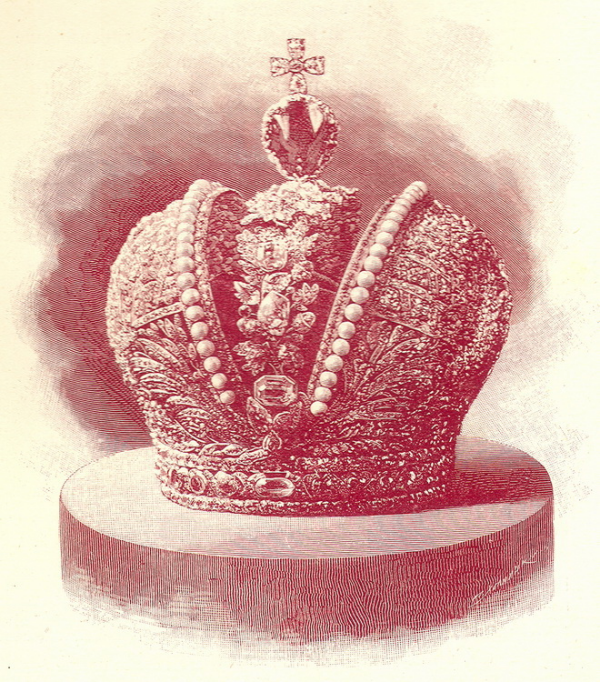 A red velvet cap sits inside the crown. 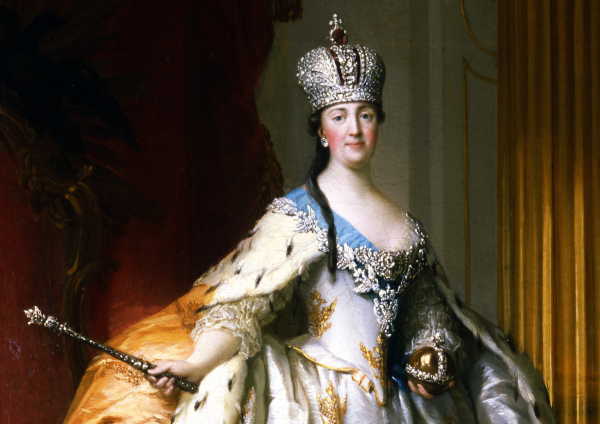 The first person to wear the crown wasn't just any monarch -- it was none other than Catherine the Great herself. Only a few days after she ascended the throne -- following the assassination of her husband, part of a coup she helped engineer -- Empress Catherine II commissioned her court jeweler, Jérémie Pauzié, to melt down jewels in the royal treasury that didn't suit current tastes. The resulting materials were used to make a new crown ahead of her coronation. 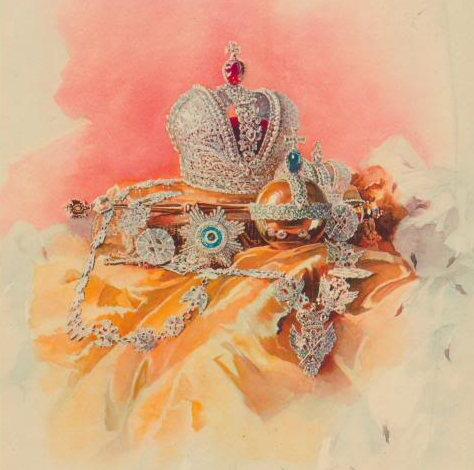 In his memoir, Pauzié called the crown "one of the richest objects" that "ever existed in Europe." Clearly Pauzié's design was inspired, because subsequent Romanov monarchs saw no need to change anything about the crown. 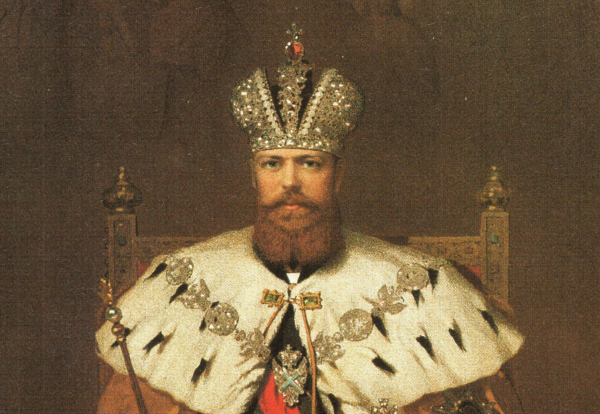 After Catherine, the crown was worn by every single Russian emperor at his coronation: Paul I (son of Catherine II) in April 1797; Alexander I (son of Paul I) in September 1801; Nicholas I (brother of Alexander I) in September 1826; Alexander II (son of Nicholas I) in September 1856; Alexander III (son of Alexander II) in May 1883; and Nicholas II (son of Alexander III) in May 1896. The coronation of Russian monarchs took place in Moscow, and, appropriately, the imperial regalia was kept in the Kremlin Armory. The actual crowning and anointing took place in the Cathedral of the Dormition, which is also part of the Kremlin complex. Although the religious leaders of the Orthodox Church were central to the coronation ceremony, Russian monarchs crowned themselves. After the prelate handed the crown to the emperor, he placed it on his own head, a gesture that was intended to signal that his imperial power came directly from God. The emperor wasn't the only person who wore the Imperial Crown. After his crowning, he removed the crown from his own head and placed it briefly on the head of his wife, the new empress consort. She didn't wear it for long, though. The emperor quickly placed it back on his own head, setting the smaller consort's crown on hers. These traditions continued unbroken for a century, culminating with the coronation of the last Russian tsar, Emperor Nicholas II, in 1896. For this coronation, a third imperial crown was made. The consort's crown, usually placed atop the head of the emperor's wife during the coronation ceremony, was worn instead by Nicholas II's mother, Dowager Empress Marie Feodorovna. Nicholas's wife, Empress Alexandra Feodorovna, wore a newly-constructed version of the consort's crown, made for her by court jeweler Karl Hahn and set with diamonds mined in South Africa. Crowns are always a symbol of power. Prince Michael of Greece, an author who has written extensively on crown jewels, has noted that the Russian Imperial Crown is "a symbol, and it's a way to show your power, your strength, your prestige." Accordingly, artistic renditions of the crown often exaggerate its qualities for effect, either emphasizing its importance and majesty or using its design as a reflection of the contemporary political environment. During the reign of Nicholas II, the latter was often the case. For example, the illustration above appeared on the cover of Puck, an American magazine that was filled with political satire. 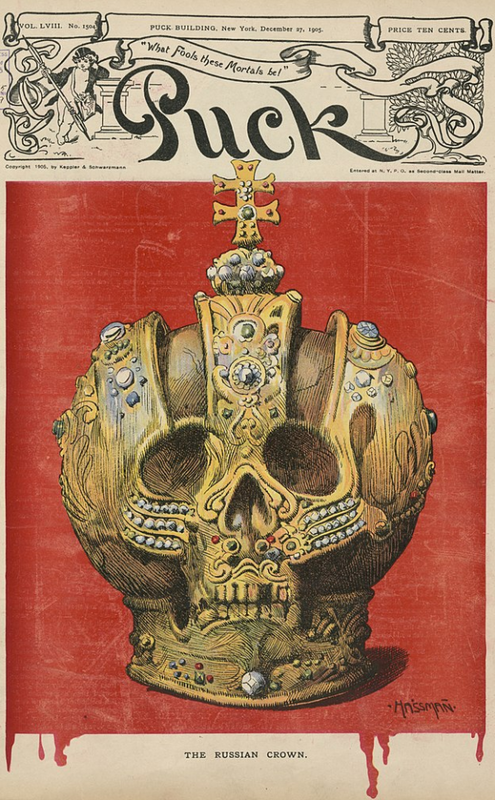 Drawn by Carl Hassmann, the imperial crown becomes a twisted, grotesque human skull in this rendering, and the background literally drips with blood. The cover, published in December 1905, was a reaction to increased violence and political instability in Russia, including a failed revolution. 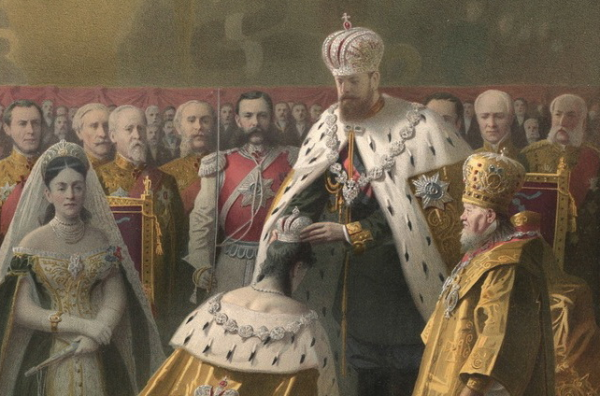 In 1906, the crown appeared in public in an imperial context for the final time. Under pressure after the attempted 1905 revolution, Nicholas made some gestures toward governmental change, including convening a State Duma, a legislative body that was essentially a lower house of parliament. 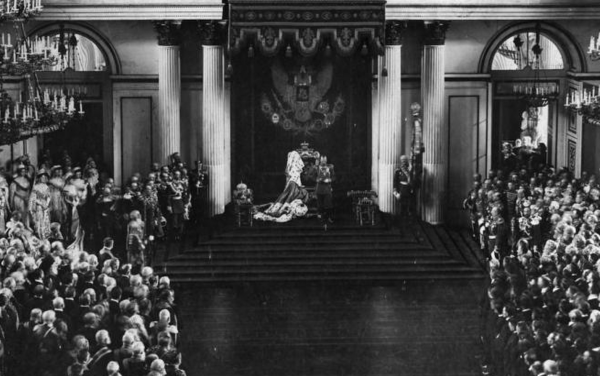 At the opening of the Duma, held in the Kremlin in May 1906, the imperial crown sat to the right of the emperor as he made his opening speech. Just before the outbreak of World War I, the crown and the rest of the imperial regalia were due for some needed upkeep. Agathon Fabergé, son of Peter Carl Fabergé, took charge of the restoration project, which was undertaken in St. Petersburg. Work was completed on the orb and scepter, but when war was declared in the summer of 1914, the rest of the project stalled. The regalia was returned to the Kremlin Armory. By 1926, the Soviet government was serious about divesting the accumulated riches of the Romanovs. The jewels were filmed and catalogued, and several pieces of state jewelry were sold to a syndicate in England (and then subsequently auctioned at Christie's in London). 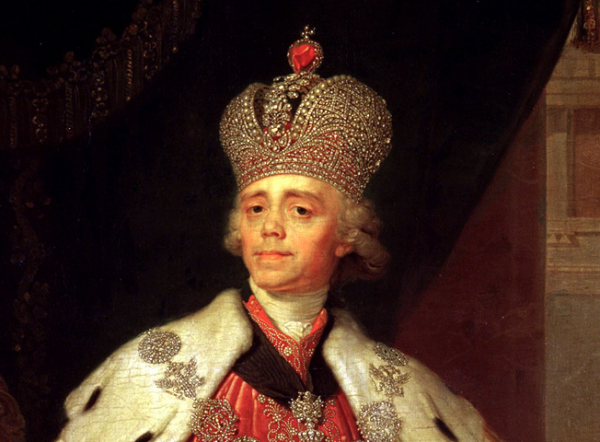 The crown itself, however, remained in Russia. In 1922, the Soviets officially established the Diamond Fund, a collection of precious gems and jewels managed by the Ministry of Finance. The imperial crown is part of this collection, which also includes such priceless gems as the Orloff Diamond and the Shah Diamond. The Diamond Fund is still housed in the Kremlin Armory today, which means that the crown hasn't strayed at all from the place where it was once used in the middle of elaborate imperial coronations. 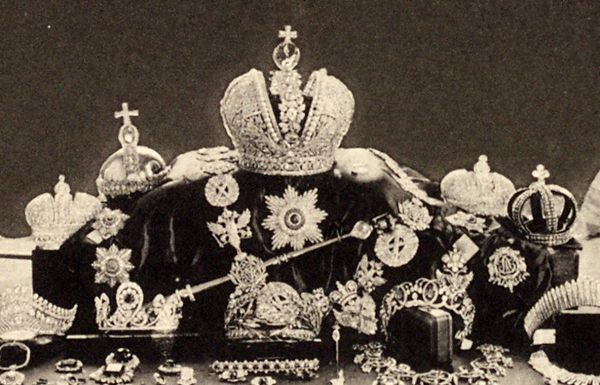 Much of the treasure of the Romanovs has been scattered or disappeared completely, so this is a rare example of a piece of Russian imperial jewelry that remains, existing as a reminder of the structures of power that came before.